Video and accompanying essay and discussion questions could be used in a single class period overview of the impacts of rising Arctic temperatures. Very general resource but could be used to demonstrate the impact on indigenous cultures. Shows the current impacts of thawing permafrost on buildings and roads, lakes, riverbanks, and some wildlife including fish. For the most part, the information provided is anecdotal rather than based on comprehensive scientific studies. It does not discuss the science of climate change or permafrost thawing. Video and accompanying background essay use the terms "thawing" and "melting" interchangeably. "Thawing" is the correct term for the temperature-induced change in permafrost. Comments from expert scientist: I liked how people living in the changing permafrost environment were interviewed. This "first-hand", applied, observational perspective coupled nicely with the scientific explanation provided. As a stand alone module, a bit of background regarding why permafrost is there and the link between fossil fuel combustion and climate warming would be useful. Consists of a set of loosely-related interviews of Alaskan residents describing the impacts they see from rising Arctic temperatures. Background essay and discussion questions provided. 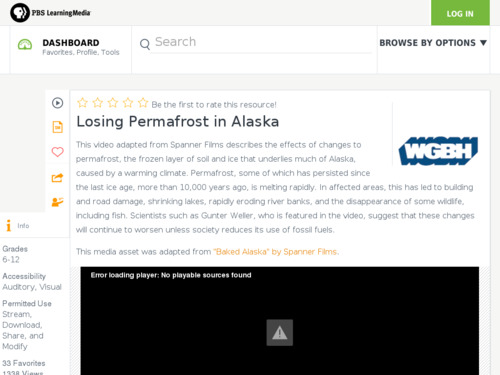 An entire lesson plan - The Effects of Global Warming in Alaska can be accessed as well. Video meant for smaller screen; pixelated when enlarged. Might be better downloaded.